Resumes means two pages information being updated whenever you want a job. But the meaning of resume has been changing; now it has built with creative and digital fields are dynamic portfolios. Whether you are working for a traditional company also you can give an impressive look to your profile with a digital appearance. Follow below tips if you are a fresh graduate, intern, entry level employee, middle level manage looking for promotion will help you to get ahead in your career. Social channels are some of the best ways to show potential employers the results and evidence which back up what you say during your application says a digital marketing expert. Twitter:It is a right platform to network for new connections and highlight your cover letter and profile. You need to be selective when you are approaching and candidates from a company networking. You need to build better connections with individuals from an organization. When you have started your job search through twitter then show potential employer that you are up to date with your industry trends. Participating in discussions will enable employers that you are collaborative and add value to your workplace. 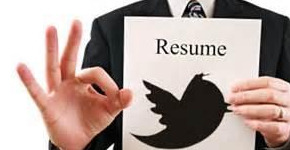 Twitter is the right platform to demonstrate your candidature to potential employers. Linked In:Your LinkedIn profile is considered as your online CV. You can upload files or links to your profile. You could upload a presentation to Slide share or link to case study that you worked on or a company blog. Looking at a candidate LinkedIn profile will ensure you that you are suitable for the recruitment or not. Pinterest:Pinterest is known for good recipes and fashionable photos but it is also a great place to keep career portfolio. If you are looking for creative profession then present yourself by posting social media campaigns, links to case studies or photos from events organized.